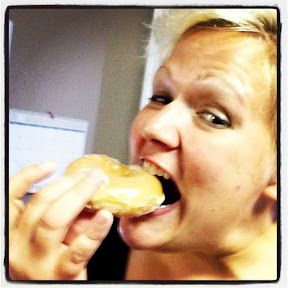 Fat Girl to Thin: Happy Doughnut Day!!!!! 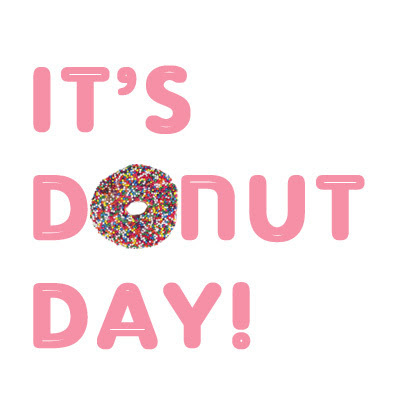 I'm not sure if you guys know yet, cause its only been all over Facebook, Twitter, and Instagram all day long but Happy Donut Day!!!!! I have been craving pizza and a donut for 2 weeks and today I got to celebrate one of the two. One of my friend at work informed me that not only was I going to get to eat a donut but that I got one for FREE!!!! 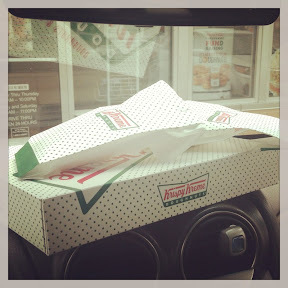 A Krispy Kreme for free....hot glazed goodness for 200 calories and $0. We even took some back to the office for everyone...turns out our boss had the same idea. Well he might have gotten the idea from a carefully worded text message. To bad we ran in to him while we were there! I am happy that I got to partake in the holiday and happy that I was able to resist the remaining 40 donuts that sat in the office for the rest of the day. My co-worker and I resisted for several hours and I finally had to hide them, no more sitting in the copy room to walk past ever 9 minutes. She did not enjoy my text! I did a lot of laughing today and this one really got me. Ok, off the donut talk. Since I have been a horrible blogger all week long and only posted every other day at best I thought I could stay up a few minutes late tonight and fill you in on the last couple of days. 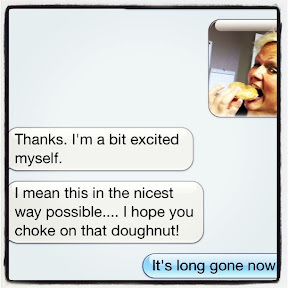 Yesterday I got up early for a run with the girl that wished me to choke on my donut. We did 4 miles in record time. Mile one: good. Mile two: great. Mile three: sucked. Mile four: record time! I wasn't pushed to get to work early so I did some more cardio before the steam and shower. I was working on my relaxation because I was getting ready for my massage. Lunch time massage, I suggest this for everyone. I did a deep tissue and worked out lots of my soreness. I had to pound water for the rest of the day to keep from getting sore. Luckily I didn't get sore from the rub down. After work I was off to a ballgame and then to the gym for a swim. I ended up being a little later to the gym than I like but I got in a great swim. I think my muscles were all rejuvenated from my massage and I swam stronger than normal. This morning it was Pump and 52 cards. Pump was the same class as normal. The room seems to be getting hotter and hotter and the sweat get to pouring earlier in the class. By the time we were done with Pump I was warmed up and ready for 52 cards. This workout was more intense than last week and I have the bruise to prove it. We did up/downs, crunches, suicides, and box jumps. The up/downs were chest to floor and they hurt. 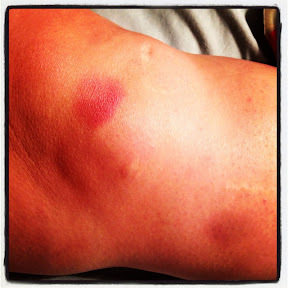 This week I have had many injuries. I have the bruise from today and then a jammed finger nail from Wednesday....look at these injuries! haha! ok, it looks better than it feels! Today I only had the one workout but I think it counted for 2 or 3. It was a doozie! After the cards we did a short row and a quarter mile around the building. Work was busier today that it has been all week long which made for a nice day. It went by so fast! My night was finished off with dinner at a country buffet and another ballgame. I got home and right in bed. I get to sleep late tomorrow, 6:30am late! I have a run and a swim planned tomorrow as well as yard work and a really long nap! If I cant manage to fit it all in I will make sure I get the nap! Happy Friday and Donut Day!!!! Hope you all had a great one. 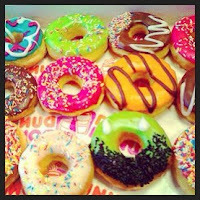 If you haven't gotten a donut yet you only have an hour left...go get your donut already!!!! I am very happy for you. This is good so that your are now looking smart. Do you know that massage is also a weight loss efforts.